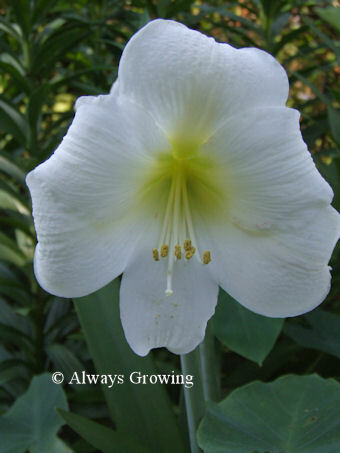 Lilies are expected at Easter, but my traditional white Easter lilies (lillum longiforum) are not quite ready to bloom. 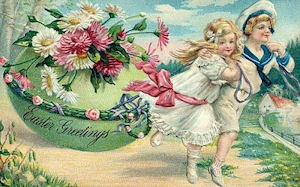 But, we were not without lilies. 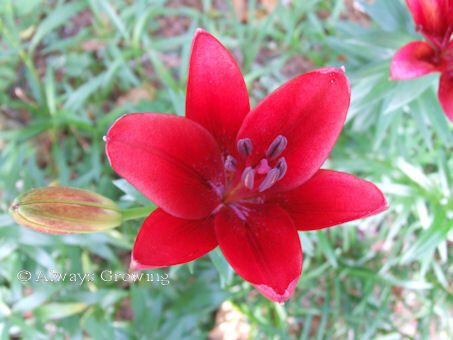 The little red lilies were blooming in time for Sunday. 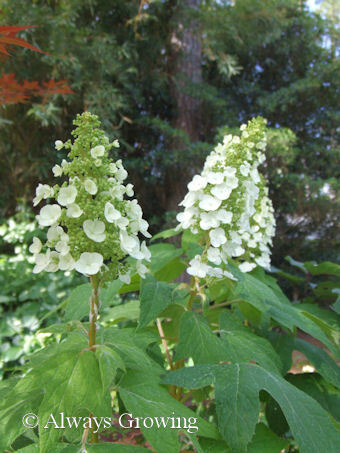 The more seasonal white was represented by the oakleaf hydrangea. The longer I have this bush in the garden, the more I like it. I am thinking I just might add a few more. 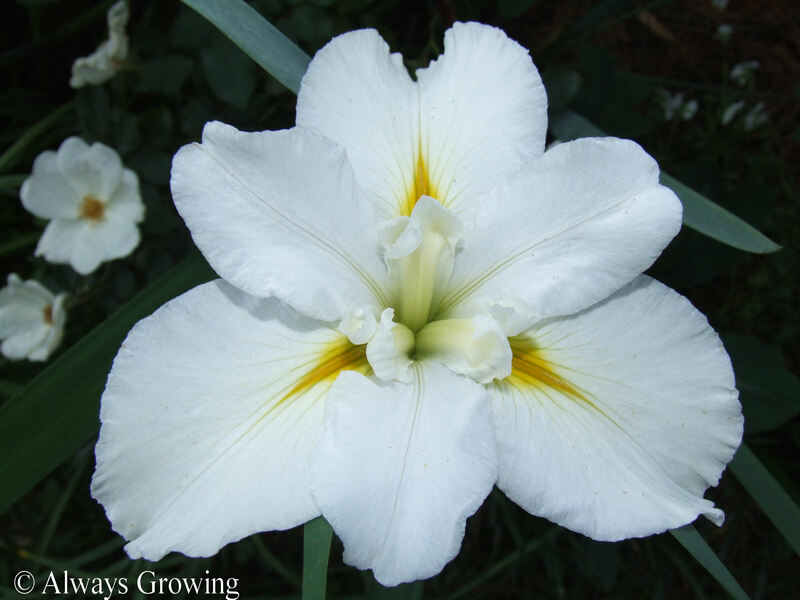 Another Easter arrival was the blooming of the walking iris. 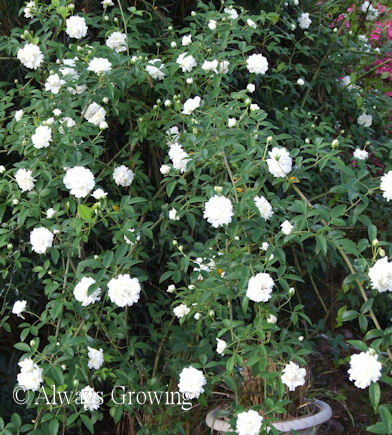 Last year they did not bloom that well because of late freezes, but this year promises to be a good flowering year for them. Since I have this week off, it has been good to be out in the garden. I worked all day yesterday, but rain this morning prevented me from being outside. I guess Mother Nature knew I needed a rest. Tomorrow morning should be a good day to finish planting everything I bought last Friday. I’ll have to post about that later. 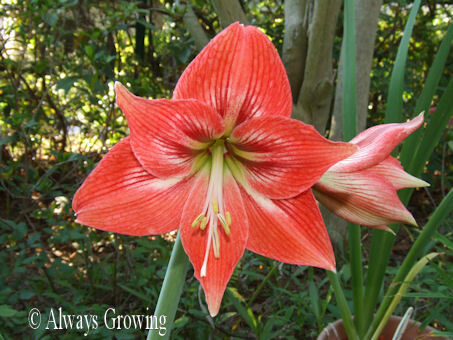 One spring-blooming flower that is certainly excelling this year in the garden is the amaryllis or more accurately hippeastrum. One of the advantages of living in a mild climate is that I can grow these in the garden as well as having a potted one or two during the winter to brighten up the dark days of December. 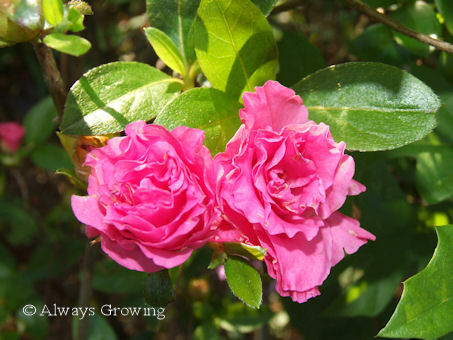 Most of mine have been pass-alongs from generous gardeners like my sister, people I work with, or friends. 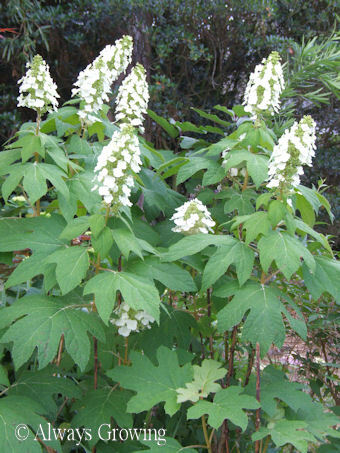 Of course, I do buy some during the fall, pot them up for winter flowers, and then plant them outside in April. 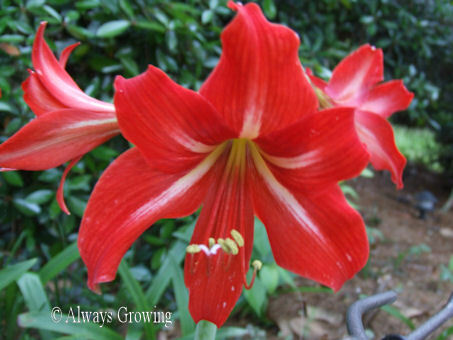 My oldest amaryllis are solid red ones. 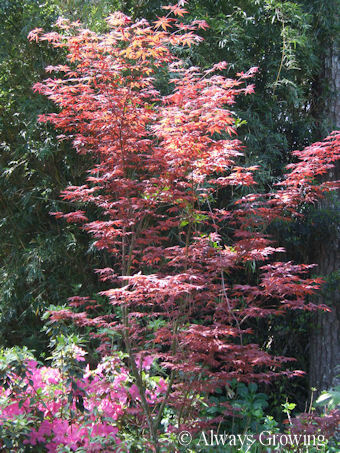 The red and white ones are planted nearby. Both of these were from my sister’s garden. 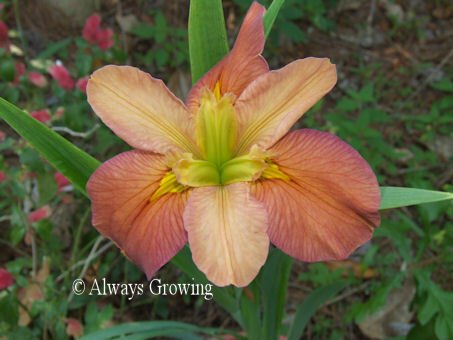 A friend from work shared several of these lovely soft orange amaryllis. 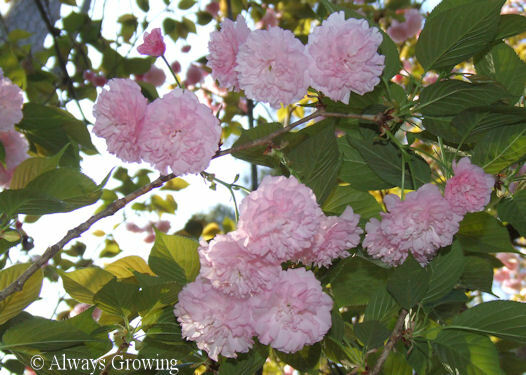 Appleblossom is always a show stopper. 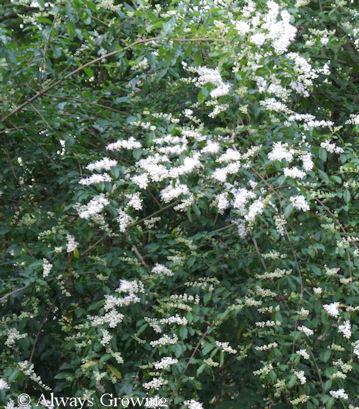 The flowers are numerous and huge. 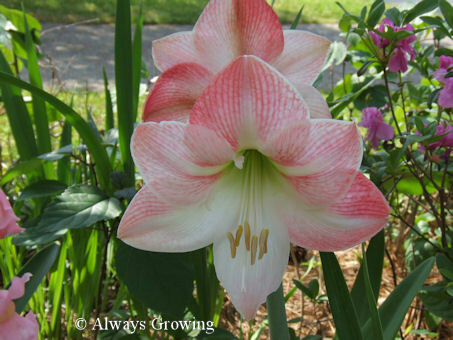 Finally, the white amaryllis, which is just about my favorite, is the last to bloom. 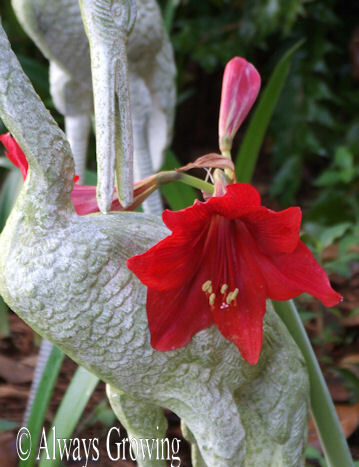 Unfortunately, the last two summers have been a fight with the grasshoppers who love amaryllis. Last year, in particular, these pests really chomped down on the amaryllis, and I am afraid many of my bulbs were unable to set flowers. 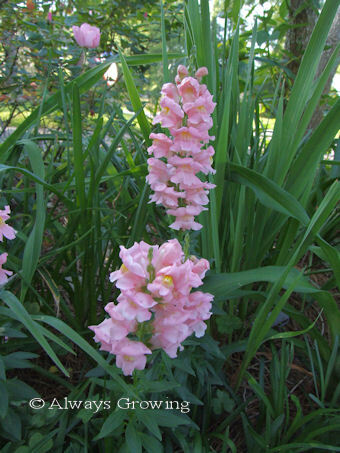 (None of my pink ones bloomed this year.) While there have been many bloom this year, a great many bulbs did not produce flowers at all, and I am thinking the grasshoppers and their appetite is to blame. In the last week, I have discovered and quickly dispatched about thirty small grasshoppers in the garden. Every day now, I go “hunting” to try and stay ahead of these voracious insects. 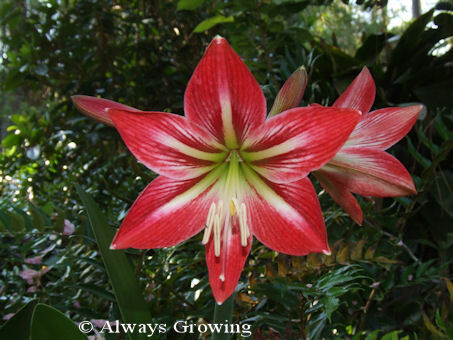 I want to make sure my amaryllis bulbs are protected so they can bloom next year as they normally would. 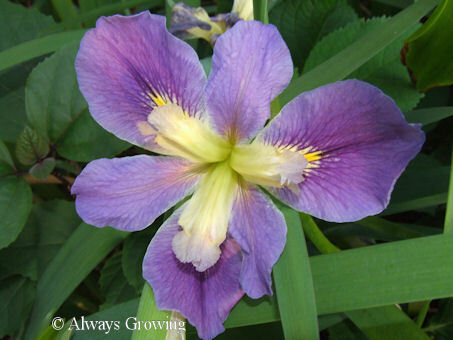 Iris was the goddess of the rainbow in Greek mythology, and considering all the colors that irises come in, it is appropriate that they be named after this goddess. 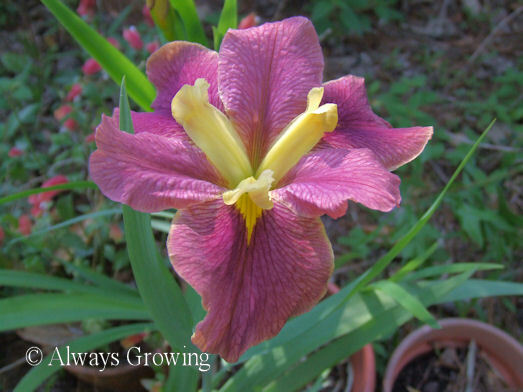 The irises I have in mind are the Louisiana irises, which despite the name, can be grown just about anywhere from the Gulf Coast to Michigan to England, Australia, and South Africa. 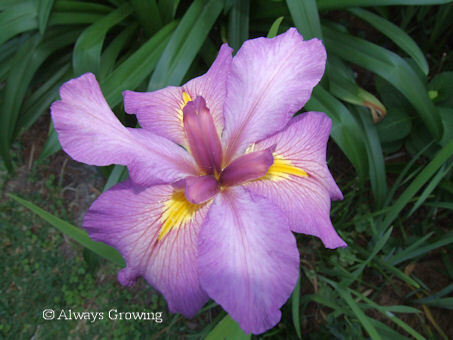 Louisiana irises are very easy to grow. 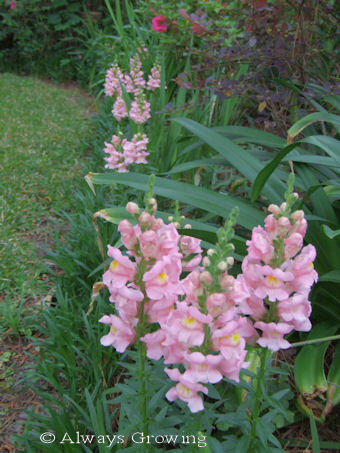 While these will grow in water, they also do quite well in the garden. If planted in water, they should be no deeper than six inches. 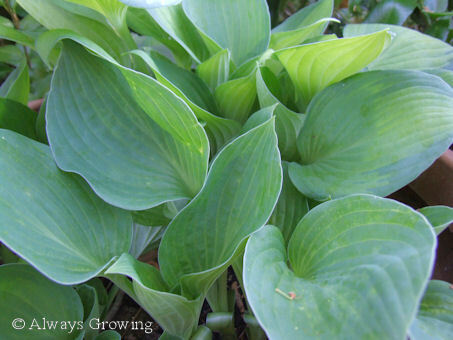 In the garden, plant 1 to 2 inches below the surface and then mulch deeply to keep in the moisture. 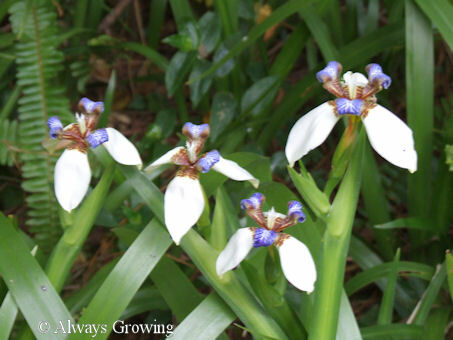 These iris start growing in the late fall and continue until bloom time in the early spring. They tend to go dormant once the warm weather sets in. I started out growing these beauties with ones shared with me by my sister. Gradually, I have added more. 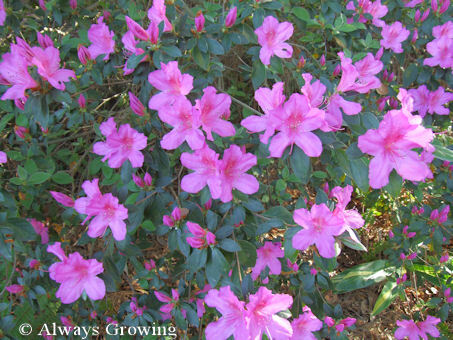 I think these are such lovely flowers and anticipate the blooms in late March/April. 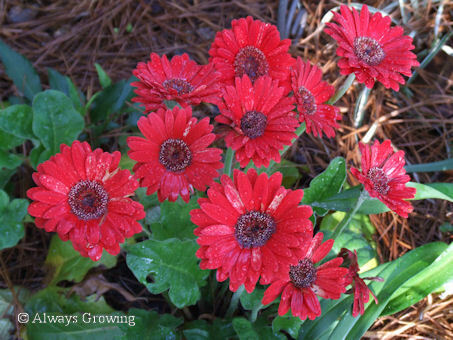 These flowers are often described as “precious jewels,” and after growing them in my garden for a few years, every time I see one of these colorful flowers, I have to agree that is a perfect way to describe them. Busy, busy, busy. The cool, sunny weather has continued here the last few days and with daylight savings time, I am able to get a few things done after work and before it gets dark. 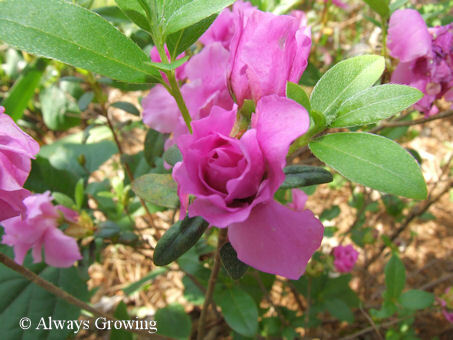 Monday and Tuesday, I trimmed back the azaleas. I do not trim them back with hedge clippers. Instead, I cut each branch which gives a neat appearance but still keeps a more natural look to the bushes. Today, it was the loropetalums’ turn at a trim. Well, to be honest, it was more than just a trim. I do not believe that I got around to trimming these bushes last year which probably accounts for the lanky growth that needed to be cut back more than normal. 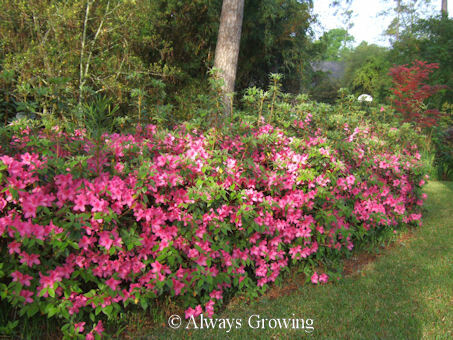 I cut these back the same way I do the azaleas – no hedge clippers. 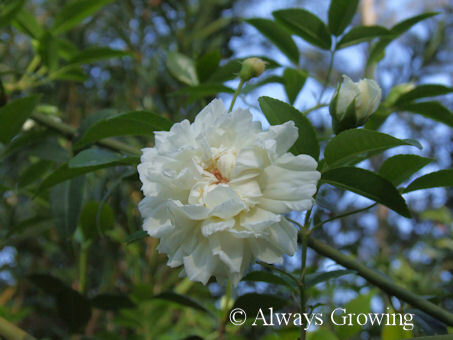 I want the natural shape of the plant to show, so that means just cutting back the height somewhat. 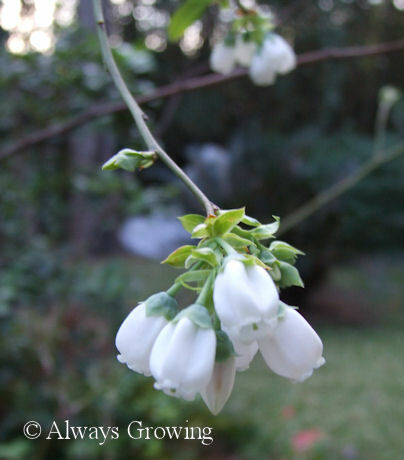 On another note, the blueberry bushes have started blooming. I think these are the prettiest, little flowers. These bushes are really dear hubby’s domain. He loves blueberries and was so disappointed that these did not bloom last year. 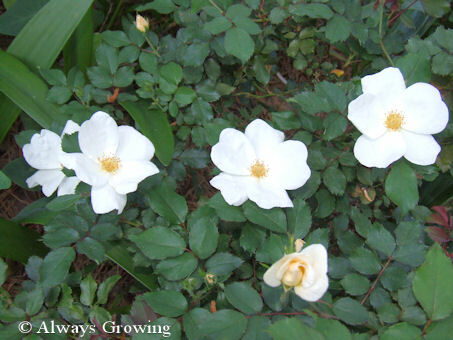 Their blooming this year is, I am hoping, a sign that they are established and will bloom more each year. Hubby may like the berries, but I like the blooms better. Usually, all I am able to do in the early evening is take a few photographs of what is new in the garden, but getting some gardening chores done this week has been very nice. I never thought I would say this, but after being able to work in the garden after work, daylight savings time may not be such a bad idea after all.